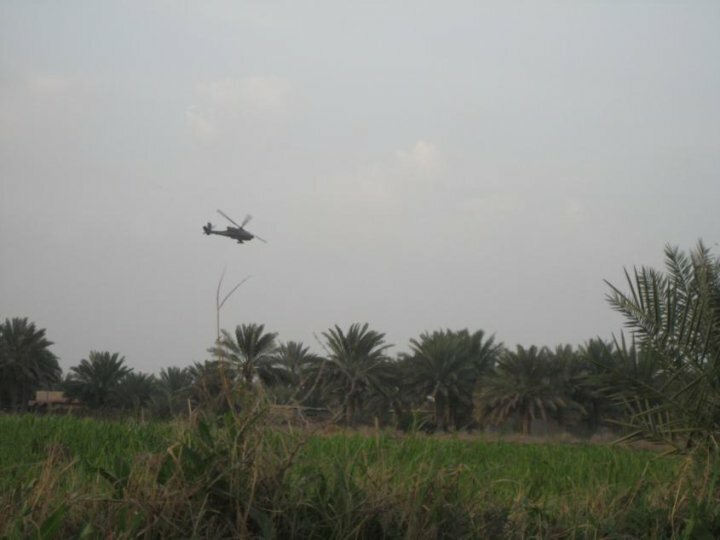 Motivator: An AH-64D Apache Gunship flies in low and hard during a raid in Babil Province, Iraq in support of my infantry platoon during a raid on a road side bomb making location. To the infantry, attack aircraft can seem like angels on their shoulders. Air strikes can be devastating to the enemy when they hit at the right moment with maximum precision. A solid pilot with a solid ground observer working in conjunction with a good infantry squad can defeat a much larger enemy force. 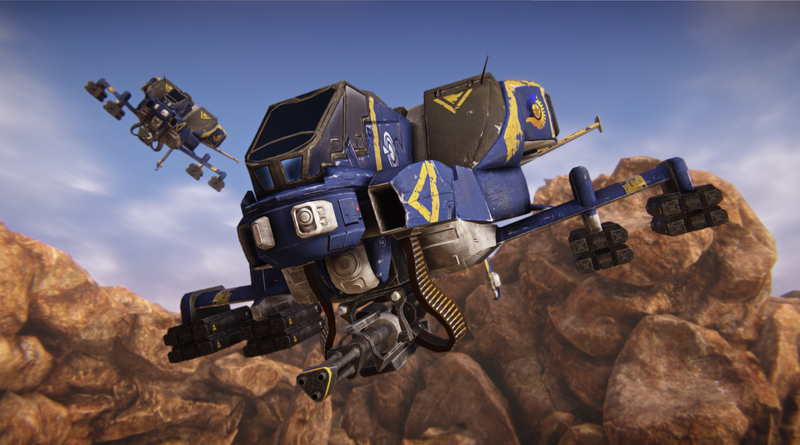 Often times, aircraft are misused in Planetside 2. A lot of players see them as kill whore machines because they can zip in, get a few kills and leave without being shot down. While that is very true, that they can be used to whore kills, I feel their full capabilities are largely overlooked. Aircraft, when used properly can control the battle. They can’t do this on their own though. They require trained eyes on the ground feeding them data on what the ground observer sees to maximize their strike potential. The observer has a huge responsibility. He has to mind the enemy, mind where friendly ground forces are, be observant for threats to the friendly aircraft, know what the friendly aircraft is reasonably capable of and, if possible, give the friendly aircraft a recommendation for ingress and egress – two terms that you will be familiar with by the end of this article. An untrained observer may say “Hey, we’ve got some tanks here, come blow them up!” which tells the pilot that there are enemy tanks near the observer and he wants them dead. Useful information but not enough information to make the air strike deadly. A trained observer might say, “I have two enemy tanks in the open 300 meters north of my position. Target marked by purple smoke. Recommend ingress from east and egress to south.” which tells the pilot how many tanks there are, where they are relative to the observer, how the target is marked and gives the pilot a recommendation on how to approach the target and leave the target area. This data will increase the strike capability of the aircraft because the pilot will be able to identify the target from much farther away resulting in more accurate fire instead of hastily aimed shots and it will increase the survivability of the aircraft. There are a few types of aircraft in Planetside 2 and moreover there are several configurations for each aircraft which can be considered different aircraft entirely. Knowing the capabilities, weaknesses and strengths of each type of aircraft is paramount to being able to call for air support successfully. I will, however, use the Vanu Sovereignty’s Scythe as an example in call cases because that is what I am familiar with, so if you fly for the TR or NC, adjust fire accordingly and I’ll make it easy to adjust fire. I’m going to group all three of the ESFs into a single category for this on the basis that they are all very similar and have counterpart weapon systems that all give them the capabilities needed for the two primary roles that ESFs can have. Any other role is simply a hybrid that falls between the two roles – Attack Aircraft and Fighter Aircraft. Attack Aircraft are essentially any ESF that can effectively engage ground targets. I say effectively because the air-to-air main gun (the Scythe’s Hailstorm Turbolaser for example) can engage ground targets but it isn’t designed to and as the game is patched its usefulness and ability to effectively engage ground targets may come and go. A pure attack aircraft would have the Light PPA and Photon Pods equipped with supporting utility and defense slots. Fighter Aircraft are ESFs that cater to engaging other aircraft. They are designed to rule the skies. A pure fighter aircraft would have the Hailstorm Turbo Laser and air-to-air missiles with supporting utility and defense slots. For the scope of this article, all we care about are Attack Aircraft. Why? Because we are calling for close air support, which is an airstrike against a ground target. Instantaneous airstrikes are great because they provide a high amount of damage to a very precise area and a high chance of destroying the target but they cannot suppress the enemy for any length of time. Liberators were bombers in Planetside 1. In Planetside 2 they are gunships. They can direct fire ordinance onto a target that the aircraft is not aligned with nose to tail. This allows the Liberator to go into a holding pattern over the area of operations and provide sustained observation of the target. Many people use them to get kills, but they are far more powerful when they are used to control the enemy. Liberators are most effective when they are suppressing the enemy and denying the enemy freedom of movement. Ideally, Liberators should be ordered to suppress the enemy’s likely Avenue of Approach, which is how the enemy will most likely travel from Point A to Point B. Let’s look at Scarred Mesa Skydock for a prime example. 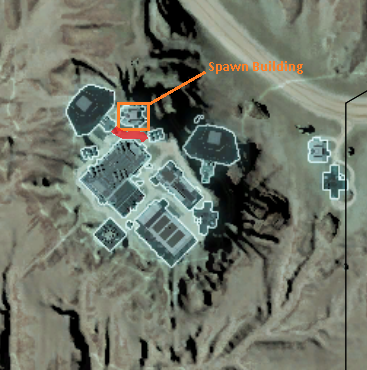 The building in the orange box is the spawn building. It is a small spawn building with only roof exits and two ground exits. All exits require a defender to move through a single choke point to the south. The area marked in red is the ideal location to ask a Liberator or two to constantly fire at regardless of whether or not they have a visual target. This will give defenders two options: Run out and mostly die to Liberator fire or stay inside the spawn building. Two Liberators can easily keep that suppressed 100% of the time if they make their guns talk, which is one fires while the other is reloading, providing a constant rain of fire onto the target. If a defender does manage to make it through, the Liberator gunners will see that and be able to alert the rest of the attacking force. Ground-to-air fire can be countered by placing heavy assaults on the roof of the building south of the spawn building to engage any defenders that might try to fire at the Liberators from the spawn building itself. As you can probably see by this example, constant aerial suppression can be a VERY powerful tool when applied properly. This concept can be very easily used elsewhere by asking for fire on various choke points to include doorways, windows, vehicle bay exits. Analyze the terrain using OCOKA and areas to suppress for maximum effectiveness will be apparent to you. Nanite Auto Repair 4 or 5 – Provides constant healing during lulls of incoming fire and repairs when pulling off station which increases on-station time. When breaking station to repair, with Auto Repair 5, by the time the pilot has found a safe landing spot, the aircraft will be over 75% repaired already. Fire Suppression – The higher the better. This will save the Galaxy more than anything and can actually boost the in flight repair rate. Precision Drops Airframe – Basically it gives the Galaxy the best agility for this particular role. Mortars + Thermals on the wings – This is the meat and potatoes of a Galaxy Gunship. With a good gunner, the Bulldog can keep a ground target suppressed in support of friendly ground forces. Walkers on the dorsal and tail gun positions – Mainly for anti aircraft. Thermals can provide the tail gun with dual purposes – easy identification of ground targets and the ability to see through smoke trails as the Galaxy begins to get low on health to more easily engage trailing attacking aircraft. One crazy gunner – more than one is useless because it is hard to get a good angle for more than one weapon, plus with the galaxy empty, the gunner can jump around quickly as needed. A Galaxy Gunship can be used much like a Liberator although it should keep moving at about half speed over the target area which will give it greater survivability should a significant threat arrive. Typically the enemy will default to firing at the Galaxy gunship, which will take the focus off of your other aircraft and allow them to engage targets uncontested. The Galaxy Gunship should engage and call out threats to itself primarily so that it too can stay overhead uncontested. Galaxy Gunships are not a swiss army knife, they have their time and place and it is somewhat limited. A good leader should know when to call for one and when not to. There is a lot to being a good Forward Observer, that is the guy that directs the aircraft to attack ground targets. A lot of that skill comes with a lot of experience and practice. Reading this article will only get you so far, you will have to spend a lot of time working in the role with some dedicated pilots to become proficient, but that shouldn’t deter you from trying because a skilled FO can be an invaluable asset to any leader because a skilled FO can literally call down the hand of God himself. There is a reason why real world infantry consider close air support to be Angels on Their Shoulders and a huge part of that at the core is a solid FO. First and foremost, you’ll need to request air assets in order to use them. If they aren’t nearby or overhead they are immediately useless. There are two types of requests: Planned and Immediate. Planned Close Air Support is known ahead of time. Say your squad is going to be hitting an enemy base in a few minutes and you know there is a squad-sized enemy presence there supported by an AMS Sunderer. Your leader asks you to get whatever air assets you can to take out that Sunderer. So you call up, get the air assets and coordinate with them to come over the objective area when you hit in order to search for and destroy the Sunderer. That is a planned close air support mission. Immediate Close Air Support is requested when you need it. You didn’t plan to use it but now you need it. For example, your squad is driving in a Sunderer when two enemy Vanguards ambush you on the road. Your squad manages to escape but the Sunderer is destroyed. You all fall back to some rocks and take cover. You call for some Immediate air support and higher up sends a wing of Scythes which take out the Vanguards. Knowing the roles and capabilities of aircraft explained above is the first step. The second step is to take in all of your situation. Here is what information you should provide when making the request. How to get in touch with you? Teamspeak, tells, yell chat, whatever works best for you and the responding aircraft. All of that should factor into your decision on what type of aircraft would be best suited for the close air support mission. Make the request however you can; via outfit chat, command chat or whatever lines of communication you have set up. Be sure to provide your situation to higher, not just that you need aircraft. Give them a good location of where you are, what you are doing and what the target is. If you don’t have something pre-established and you are essentially asking the public for helping, portraying a vision of a big juicy target for some capable pilots will typically get you a response. It’s best to keep a positive line of communication open with all friendly outfits if you don’t have aircraft of your own. How many aircraft and their types. What types of ordinance from biggest to smallest and round counts for each. How much “play time” they have, which correlates to how much fuel they have – We obviously don’t have to worry about that in Planetside 2. Here is an example of a proper check-in, modified for Planetside 2. Responding aircraft: Saber 1 this is Chrome 2, attack fligth leader checking in. We are 3 Scythes each armed with 70 Photon Pod and 300 rounds of Hailstorm Turbo Laser. Forward Observer: Chrome 2 this is Saber 1, we are an infantry squad on a hilltop marked by purple smoke. Friendly armor along the road to our south. Hostile armor to our southwest currently engaged with friendly armor. Go into a circular holding pattern 1 kilometer to our east. And that’s it, you now are in control of a flight of 3 Scythes that are primed and ready to lay down the hand of God. You know what they are packing and their capabilities. They know a general lay of the land and the situation. Target Description – Is it a tank or infantry? What the target is will determine how the aircraft engages the target. Location of Enemies – Where is the target? There are many ways to describe target position. See Other Considerations for the explanations of each method. How is the target marked, if it is? – Smoke is probably ideal here although if the aircraft is in the same platoon or squad a waypoint can also work. Location of Friendlies – Definitely a good thing to identify where friendlies are to minimize the risk of fratricide. Smoke is ideal, waypoints can also work. Possible route of egress – Tell the aircraft a safe way to get the hell out of there after engaging the targets. There is really a lot of flex room here for what you provide and it is largely situation dependent. This is one of the aspects where experience plays a huge role in skill. Now it is your turn to watch the fireworks. There are many methods to verbally identify targets to the aircraft you are controlling. Some are easy such as putting smoke right under the target’s feet and some are something that require some thinking such as walking your aircraft onto the target. The key thing to remember in all cases is that what you are seeing is very different than the aircraft will be seeing as they approach the target area and the pilot typically has a very short window of time to identify the target, so any directions you provide have to be something compatible with the aircraft’s POV to make it faster for the pilot to identify the target. The key phrase when it comes to identifying targets is Keep it simple. Do you see the hilltop at my position marked by purple smoke? (Yes.) Look south about 350 meters, do you see a road? (Yes.) Follow the road to the west about 250 meters, do you see a left turn in the road? (Yes.) Look about 100 meters north of the left turn in the road, do you see a cluster of trees? (Roger.) Your target sunderer is under those trees. The method is extremely effective but requires a lot of practice. Most times it is best to identify your target’s position on your map and then reference the map when providing landmark descriptions as that is the closest representation to what your pilot will be looking at. As a Forward Observer you are also a Forward Air Traffic Controller. Any aircraft that are overhead in your airspace that you are talking to are in YOUR control. They should respond to YOUR commands diligently and dutifully. I understand that is in a perfect world but that is what you should strive for. You have to manage aircraft and provide targets. You may end up having a flight of Scythes and a flight of Liberators and you have to manage both flights, giving them commands and targets independently. Holding patterns a way for you to put the aircraft in reserve. A holding pattern should be established when their is no immediate need for close air support. It is sort of a queue. The holding pattern should be over an area that is safe for the aircraft but close enough that they can respond to your commands. With multiple flights, you can put them into the same holding pattern however you’ll want to stack the aircraft at different altitudes. Aircraft should be stacked at altitudes relative to their optimal engagement altitude so that they don’t have to climb or dive much when you call them for a mission. Attack aircraft, for example, should be stacked lower than Galaxy Gunships, which should be stacked lower than Liberators. An alternative to holding patterns is to assign the aircraft secondary missions based on their capabilities. If they have Air-to-Air capabilities, push them to another location where they can defend your location against incoming enemy aircraft. If they are primarily air-to-ground, put them on an Air Interdiction Mission between your position and the enemy’s reinforcements most likely avenue of approach to stop the enemy from receiving reinforcements. Ground-to-Air is a huge threat to aircraft. As a Forward Observer your job is to use the aircraft to put effective fire down upon the heads of the enemy. You also need to worry about the aircraft as they can be shot down easily and just like that you can be stripped of your air support. The key thing to remember is that the more presence your aircraft present on the enemy, the more likely they are to pull ground-to-air weapons and start swatting your aircraft out of the sky. If your aircraft do not present juicy targets to the enemy they will probably not hop into their Burster MAX. Only have them fly near your target area when they are on a close air support mission. After they have engaged your target, they go away, either to a holding pattern or secondary mission. Never have them fly over the target directly. Scythes should engage from afar and egress before they fly over where the target is/was. The whole idea is to keep them out of the umbrella presented by a ground-to-air weapon such as a Burster MAX or Stryker gunner. The umbrella is just that and can be imagined as a dome over and centered around that weapon system with any terrain or buildings blocking out areas that cause blind spots. You should be able to see why hugging the terrain or using terrain features such as a mountain as visual cover can be so handy. By default your aircraft will engage targets that you give them as soon as possible, but there are alternate fire commands that can be given to give you greater flexibility. Time on Target – Engage the target at a certain time or after a certain amount of time has elapsed. This is valuable when you are actually raiding a particular location such as by Galaxy drop. Say your galaxy will be at the drop zone in 3 minutes and you want the aircraft to put some clearing fire on the drop zone to clear it of any enemies seconds before the galaxy arrives so you get them synchronized to the target location and tell them to engage it in 2 minutes and 45 seconds. While this method may sound not very useful, there are times when it is feasible. Fire At My Command – This primes the aircraft to engage the target – they put the target in their sights. Then they wait until you tell them to fire. You can tell the pilot to fire once or continually after your command by saying single shot or rapid fire. A great example of this would be when clearing a building. A Liberator gets into position to put rounds through a large open window or door into the building that you will be clearing. Just before you enter, you give the command to fire 3 rounds and after the 3rd round impacts, your squad rushes in to find the enemy still running for cover from the Liberator fire.